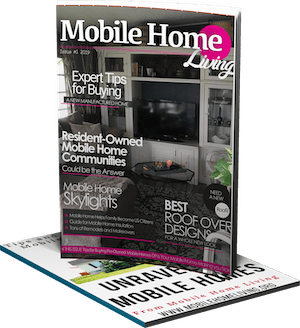 If you’ve read Mobile Home Living, you know how I much I love to share gorgeous manufactured homes. Especially ones that are personalized by the owners. 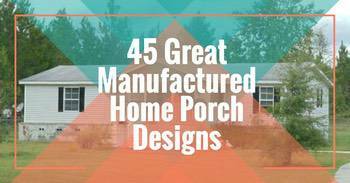 Whether it be a complete remodel or a simple update, those are the ones that inspire me the most. It proves, without a shadow of a doubt, that our homes can become anything we want. 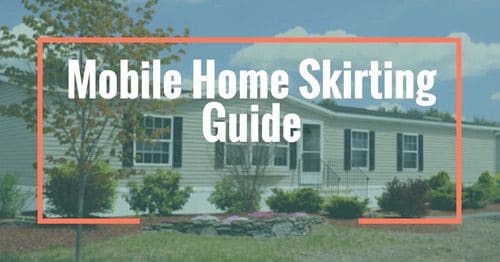 This gorgeous New York state double wide has so many great manufactured home remodeling ideas and decorating inspirations. 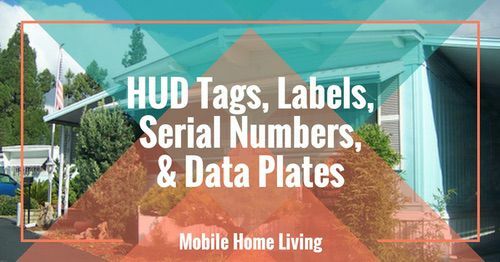 It is a marvelous example of what a manufactured home is all about. Related: A Dreamy Double Wide for Sale in Palm Desert. 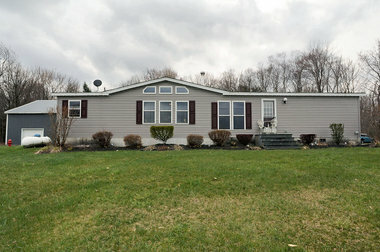 I found this home on a site called Syracuse.com. It’s a home that was/is for sale and was named their “Home of the Week’ on the blog. Once you see it, you’ll understand why. THIS DOUBLE WIDE IS AWESOME! I can’t get over how beautiful it is. The zebra flooring, the glass tile kitchen backsplash, the dark cabinetry, the stainless steel, the butcher top…I could go on and on and on! If you look at the pictures of this week’s “House of the Week,” you’ll see what may appear to be a chic million-dollar Manhattan apartment. But the property isn’t in the Big Apple. It’s at 109 Morey Road, West Monroe. And forget the million-dollar price tag — the asking price is $124,900. 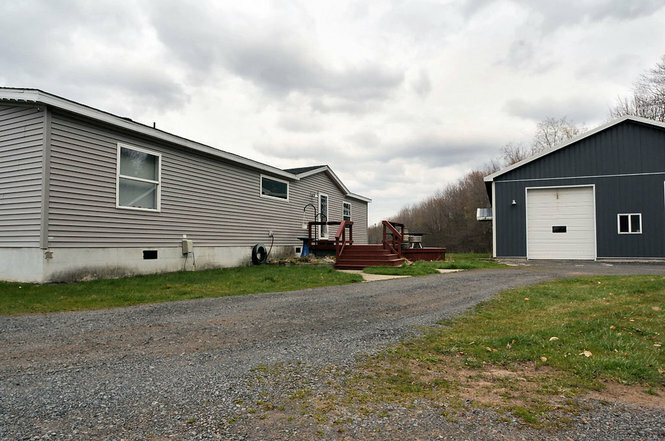 Also, it’s not an apartment, it’s a double-wide mobile home with three bedrooms and two baths on more than 4 acres of land. And here’s something you won’t see on the Upper West Side or in SoHo: a 2,000-square-foot barn with three 12-foot bay doors and a second-floor storage space. Christopher and Kristen Zimmer bought the property and had the former model home installed in 2000. 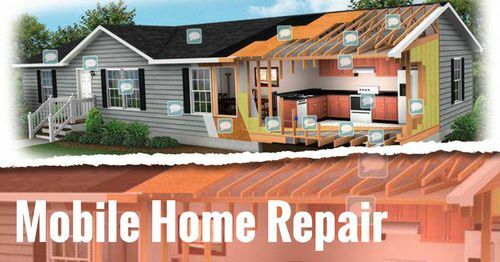 The home is manufactured with 2 by 6-inch framing, upgraded windows, and double insulation. The Zimmers added the barn in 2008, installed vinyl siding in 2010 and replaced the roof with architectural shingles in November. The home, at the end of a long crushed-stone driveway that ends in a circle, is oriented so the only entrance faces the back of the rural property. Chris planned it that way so the majority of the windows in the open-plan living, dining room and kitchen would overlook the front of the property as well as acres of open land beyond.The Zimmers have been busy updating and decorating the home. Chris, a welder by day, has a keen interest in design, remodeling, and cooking The home truly reflects his hobbies and talents. One wall of the living room, which used to house a gas fireplace, now holds a 65-inch flat screen TV, which the Zimmers are taking with them. 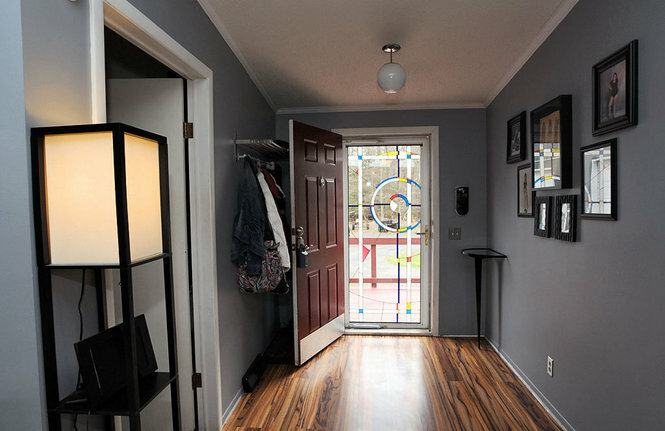 Tall double-hung windows provide natural light and laminate floors add to the clean, modern look. A stainless steel and glass free-standing wood stove between the living and dining areas is eye-catching, even when not in use. Chris said the stove heats the home so effectively they rarely use the forced-air propane furnace. 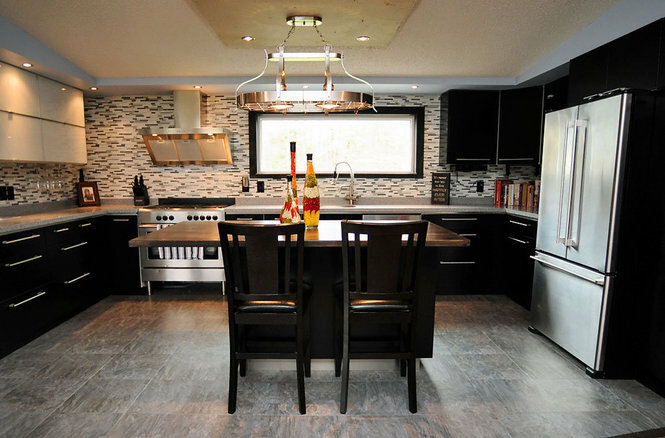 When Chris remodeled the kitchen, he elevated the floor a few inches and covered it with 16- by 16-inch laminate tiles that look like slate. The lower cabinets have a black lacquer or enamel finish and the upper cabinets, some of which have translucent white glass fronts, tip up to open. All doors and drawers are “soft closing,” which prevents slamming. The backsplash is made of very thin horizontal glass and stone tiles, which coordinate well with the gray solid surface counters and cabinets. The stainless steel appliances include a high-end extractor hood/vent with halogen lights installed above a range with five propane gas burners and an electric convection oven. There is a dishwasher as well as a French door refrigerator that will stay in the house. A 6-foot-wide window set above the extra-deep stainless steel sink overlooks the back of the property and the two-tiered deck. A butcher-block-topped island provides seating for three and is plumbed for the possible installation of a small prep sink. 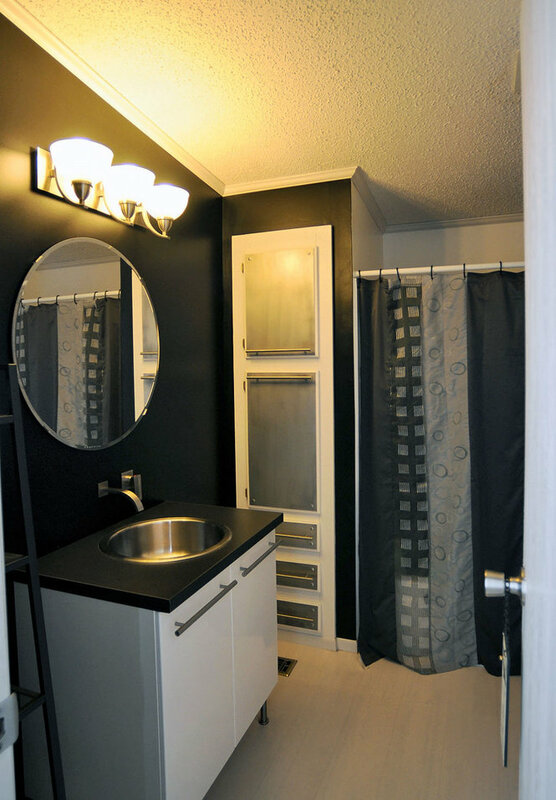 The home has a separate laundry room across from an updated full bath. It includes a round stainless steel sink, a combination fiberglass tub and shower and a laminate floor that looks like pickled or whitewashed oak. There are two carpeted bedrooms on that end of the home. The master suite is on the other end. 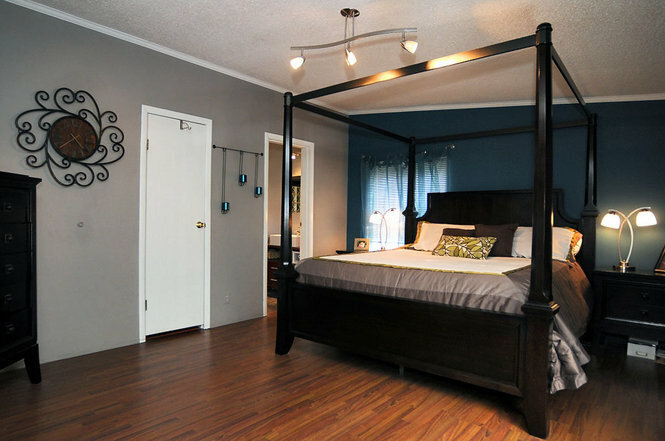 It includes a vaulted ceiling, walk-in closet and plenty of space for a king-size bed. Chris remodeled the master bath, adding ceramic tile floors and walls and a walk-in shower with an oversized square chrome shower head. Glass blocks top a ceramic tile wall that divides the shower from the commode. His and hers vanities each have rectangular porcelain vessel sinks. While the many upgrades are reminiscent of finishes and features you might see in a SoHo loft, unlike its downstate counterparts this property has a well, a septic system and plenty of space for parking. For more information, contact Kellie Jo Maher, of Coldwell Banker Prime Properties, at 427-0307. A home this beautiful would easily run you a couple hundred thousand but it’s $124,900 and that includes the land. 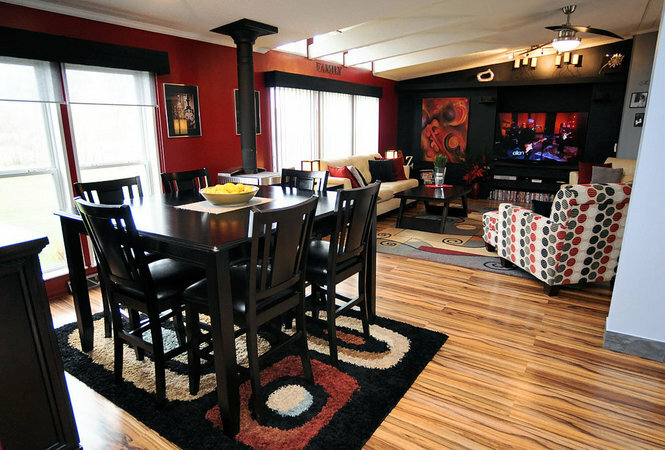 Manufactured homes really do allow you to have a dream home that’s affordable. This more than proves the point. It’s a beautiful home and whoever buys it is one lucky person! Wow! That house is absolutely stunning! Wow! That house is absolutely stunning! It is so elegant but looks like it’s also family and entertainment friendly. Thanks for posting this. I live in the city and my taxes are outrageous! It’s why I’m drawn to owning some acreage in the country with a view. 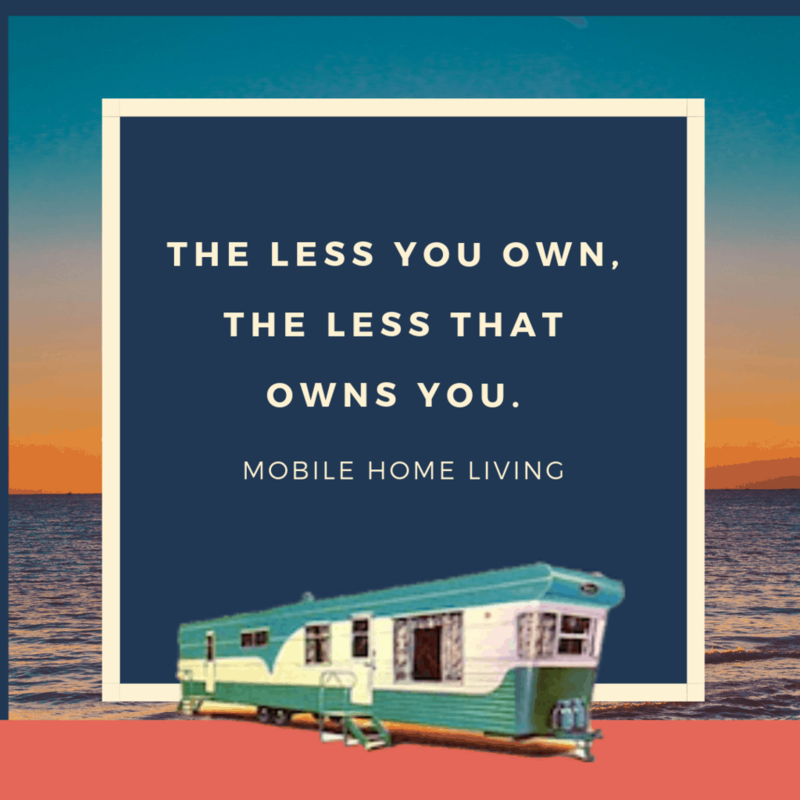 Do you know of any mobile home manufacturer that would sell just the shell or perhaps one that would build it to my plans? I’d love to do something like this for my retirement home. Hi Carl! 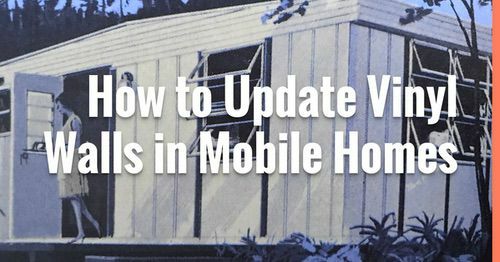 Actually, most every manufactured home dealership can build it exactly how you want it. It does normally cost a bit more and takes a bit longer to deliver than their standard inventory but it’s built to your specs exactly. You should be able to call just about any dealership in your area and get the home of your dreams 🙂 I hope you get it soon! I pay 260.00 a year for a '99 16' X 90' on ten acres with a farm pond, large shop, greenhouse, and two outbuildings. It really is insane how wide a gap in taxing across this country. Wow! That is crazy cheap and amazing sounding! Greenhouse? Pond? Storage? and affordable? Sounds like paradise to me!! Hi Crystal! I was shocked at the taxes too. Where I live, rural taxes are so cheap compared to the towns and cities. I have to say that the exterior does not give any hint of what lies indoors. They have added a lot of contemporary touches to make it their own. Love the floors, the large entry way and master bedroom. Four acres plus a home and barn for that price would make me a happy girl. But I would have to invest in a few gallons of paint as the colours are too dark for me and those taxes! yikes. I know this is old, but just came across the link. Syracuse is in Central NY. The taxes here are killer. And yes we still pay income tax. Lots of it. Which, besides the weather, 8 months of cold. the biggest reason ppl move out of state, especially for retirement. The taxes on this property are typical, although probably a few hundred more today than when this was first published. It is gorgeous here, but it’ll cost ya. I thought the same thing but I'm in WV and used to really, really cheap taxes. You'd have to save up about $400 a month just to pay them once a year, yikes! By the way, thanks so much for commenting. I lost 1248 comments in the move and haven't quite figured out how to get them back (I can see them in the back end just not on the site) so I didn't know if the comments even worked at all. I'm glad they do! It's a beautiful home but those taxes are really steep! I am wondering if this is why they are moving away from that paradise.